Cut the stem off of the flower bud. Glue the wooden bead to the bottom of the bud. This will be the angel's head. Glue two leaves to the back of the angel (close to the head bead) to form wings. Paint the bead string gold with acrylic paint. Dry. Glue one end of the string to the back of the wooden bead head. Form a loop with the string and glue the other end next to the first end. (See picture). Draw eyes using black felt and a round mouth using the red felt pen. Tie a bow with the gold cord and glue to the angel just under the chin. If you want to hang the angel as an ornament, glue on a loop of satin ribbon. 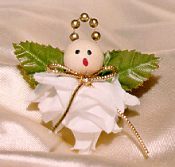 If you want to wear the angel as a brooch, glue on a brooch pin. Try making the angel in different sizes suing different types of flower bud. You can try different colors, too. Optional: paint the angel's head bead solid gold or white.